Appropriate for classroom teachers, new teachers to dance, and experienced practitioners who would like to enrich their teaching. No prerequisite. 10% Professional Discounts available for this course for Dancers’ Group/CDEA/NDEO members. 50% off for current full-time students. Please contact 510.883.1118. Summer 2018: July 30 – Aug. 3, 9am-5pm. Summer 2019: July 29 – Aug. 2, 9am-5pm. Reflective Practice is a core tenet of Luna’s teaching values and is integrated into all Professional Learning (PL) workshops. It is offered in alternate years as a discrete half-day workshop. Teachers practice observing clearly, explore the art of the question, and strategize ways to engage students in reflecting on their creative process and products. Part of Luna’s Foundations Series. Prerequisite: any prior PL experience at LDI in the prior 3 years. Curious about how a reflective practice can benefit you & your teaching? Check out our short video. Explore the full scope and sequence in dance learning from unit-to-unit, year-to-year. Content includes deepening skills of observation, reflection and critical thinking; action research; assessment; advocacy. Participants learn to teach choreography from phrasing to group forms, using structures and principles of design. Action Research and Evaluation & Assessment workshops are included in this course. Prerequisite DIDC-B. Continuing where DIDC-A leaves off, this course investigates the role of the teacher in creating, implementing and sequencing dance curricula aligned with the National Core Arts Standards using backward and forward design and embedded assessment. 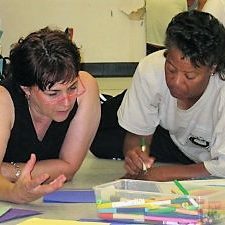 Participants learn a process for moving students from exploration through improvisation to composition in a manner that allows for maximum exploration, problem posing and solving, and choice making. In the process, they deepen their understanding of the elements of dance and forming. Course content includes choreographic devices, the principles of design, forms, contemporary learning theories, including constructivism. This course is mandatory for LDI certification. Meets college/university professional standards. Prerequisite DIDC-A or Summer Institute.